We seem to all about our new Japanese Import fabrics lately, and I am not surprised! There are loads of gorgeous new things to swoon over. Today I'm sharing these floral brushed cottons. They're a slightly heavier weight that makes them appropriate for skirts, pants, bags, and jackets. Next we've got these cotton border prints. With sweet little birds on a soft twill weave, you'll have the perfect blouse or dress for layering! Today we are chatting with Treadlette Nina. Hi Nina! Tell us about yourself! "I have been sewing since I was around 10, but really started to like it when I was in junior high and high school. I have been at Treadle about 18 years. I like to make clothes for myself and baby clothes." Nina has a fantastic, unique style and isn't afraid to try quirky elements or mix fabrics for fun effects. "I think of my clothing style as extension of my artistic practice, using color and pattern to express myself. Knits are a favorite fabric of mine currently, with the Moneta dress and Moneta/Wren mash-up being a staple garment in my closet." Nina has a background in fine art and comes from a family of artists. Her work explores the use of fibers and the overlap between areas perceived as "art" vs. "craft." "One of my favorite projects is a piece I did for my Junior Review at Augsburg. Lately I have been excited to do some surface design and paintings on fabric to turn into wearables." Nina also teaches classes for kids and teens at Treadle. You can find her classes at our class schedule page. There's more to come on Treadlette Tuesday, next week and every week! We have some gorgeous new knits on our new arrivals table, like these floral rayons. Rayon knits are fine and drapey, making them perfect for any pattern with a lot of gathered, scrunched, or draped details. Don't worry about adding bulk with these fine jerseys! These border printed rayon knits can be manipulated on the cross grain for lots of interesting effects! You've probably seen store manager Roberta at Treadle. She started sewing in junior high: "I made a harvest gold, wide wale corduroy jumper. Guess what era that was?!" Roberta has now been at Treadle for over 30 years and is a devoted apparel sewer. With her classic sense of style and great knowledge of fine fabrics, she loves a well-made garment and always appreciates well-placed details. "Shirts, blouses, tops and jackets are my favorite projects. I'm a fiber snob - I like to work on any natural fiber fabric. I love to do French seams, welt pockets and bound buttonholes." Her most recent project was a pair of flannel pajama bottoms. Unfortunately, they didn't require any of her favorite fine sewing techniques! And a favorite project of all time? "Years ago I made a jacket/top with a Vogue Issey Miyake pattern. A co-worker advised against trying to second guess the pattern's sometimes counter intuitive instructions. The garment went together beautifully, with seam finishes and perfectly mitered corners." I'd like to add MY favorite project Roberta has made recently: this gorgeous jacket made from one of our Japanese import fabrics. We'll be sharing more in our Get To Know Us series, next Treadlette Tuesday! Sew Good Goods Event at Treadle! Treadle Yard Goods partnered with Sew Good Goods for June’s Grand Old Days Grand Meander. Thank you to all who purchased pillowcase kits and those who took advantage of our classroom space and sewed them up for immediate gratification! Because of your generosity, we sold 50 pillowcase kits and raised $350 for Sew Good Goods. Join us as we again partner with Sew Good Goods to benefit individuals and families in transition. 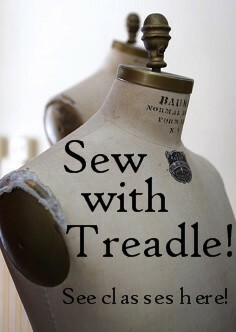 Treadle will open our classroom for an afternoon of sewing, socializing, & treats. What: Sew Yo Baby! Bibs or school tote bags. Items are pre-cut - all you do is pin & sew! Sewing machines will be fired up & ready to go! When: Friday 3:00 - 7:00 September 23. Join us for as long (or as short) as you like. Please call Treadle 651-698-9690 to reserve your space. Walk-ins also welcome! Who: Advanced Beginning Sewists age 14 and up. Cost: Free! Treats provided and all those participating will receive a discount coupon for Treadle fabric. Why: Sew Good Goods is a local non-profit that embraces the notion that in creating and giving hand-crafted goods a unique connection is made and shared. Yo Baby! Bibs will be donated locally to families in transition. School tote bags will be sent to CWS to be filled with school supplies. CWS works with partners to eradicated hunger and poverty and to promote peace and justice around the world. School kits give children in impoverished schools, refugee camps, or other difficult settings some of the basic tools for learning. Don’t sew, but want to help? Treadle will be accepting donations of school supplies to fill the finished tote bags. We have a great new class coming up: Japanese Purselet with instructor LaVaughn Bye! A cute twist on a way to carry essentials, a wrap for a small gift, or a gift-in-itself! Coordinating strips are sewn, pleated, twisted, and lined to make this unique little bag with loads of charm and visual texture. Embellish the drawstrings and you're done! You can see all our current classes at www.treadleyardgoods.com/classes. We have some new cotton plaids in our Japanese import section that are just luscious. Soft brushed cotton meets color harmony in these plaids that are perfect for fall shirts and dresses. New Post Series: Treadlette Tuesdays! Hi, and welcome to our new post series! There are a lot of us working at Treadle. We call ourselves the Treadlettes, and we want you to know a little more about us! In the next couple months, we’ll be introducing all of the people who make Treadle so special and telling you more about ourselves. To start our Get To Know Us series, I’m Elizabeth, your friendly neighborhood blogger! I’ve been working at Treadle since Summer 2011, and in 2012 I took over writing our store blog. I’ve been sewing since I was in my teens, and I quickly discovered my One True Sewing Love: historic costume. I have been devoted to historic sewing for many years, and I love researching how to make my historic garments as accurate as possible. Of course I also love dressing up and attending historic events! Probably my favorite historic dress I've made is this 1770s handsewn orange silk taffeta robe a l'anglaise. I like to sew modern garments, too. It’s so nice to be able to wear something you’ve made in your daily life! I also dabble in quilting and crafts. It’s good to spread your projects around a little. I started teaching at Treadle in 2012. I started with just a hand sewing class and a hat making class, but I really loved teaching, so soon I added more and more classes, and now I teach all kinds of things! I’ve also been lucky enough to take over coordinating our class schedule. Stay tuned for more bios, product recommendations, and favorite pattern picks from us, every Treadlette Tuesday! We know you love the sweet softness of Japanese cotton double gauze. Nothing is quite like it. Especially with pretty new prints like these! Come in and shop all of our fabulous new import fabrics! If you loved the cute animals on canvas we shared last week, take a look at these other new Japanese printed canvas fabrics. This cat print is cut and sold by the repeat as a panel. The city panel features illustrated maps of major landmarks in these famous cities. These allover prints are bright and beautiful! We have new Cotton + Steel prints! Take a look! These printed selvages are a great detail that add a little something extra! There is always so much more when you stop by our store! We have several gorgeous new prints from Art Gallery Fabrics. Their 100% premium cotton is so fine and silky, we keep these with our cotton lawn and shirting fabrics. The fabric's weight and the lovely prints makes these ideal for blouses and other light, soft garments. Treadle will be closed on Labor Day, Monday, September 5. Shop regular hours over the weekend! Saturday 10-5 and Sunday 1-5.